So, both those figures came from Series 1. But the Science Fiction Mystery Minis came back for Series 2, and in addition to the 1:72 Kane with Facehugger, there was also a 1:12 Alien Queen. In the original 1979 Alien, the titular peen-monster was a solitary creature, with only a hint that there was more to the species (namely, an entire room full of eggs, though only one hatched). It wasn't until 1986's Aliens that we were introduced to the rest of their insectoid hierarchy. The thing is, in 1982 the X-Men comics had introduced the Brood, aliens that reproduced by infecting other organisms; yes, they were clear rip-offs of the xenomorphs, but they had a queen in the comics before the movies did. The Queen is one of the biggest figures in this series, in addition to being one of the most common, which means that if you're trying to get a sizeable figure like Voltron or Godzilla, you're likely to get tricked by the Queen. I've personally come across probably half a dozen of her while trying to find other things. Because of the Mystery Minis style and her squatty, horizontal stance, the Queen ends up being slightly shorter than her drone. The details are intricate, by the standards of this line, with ridges all the way down the tail, spikes sticking out of her back, hollows in the heels of the feet, and minorly inset spots on the hips and head-crest. 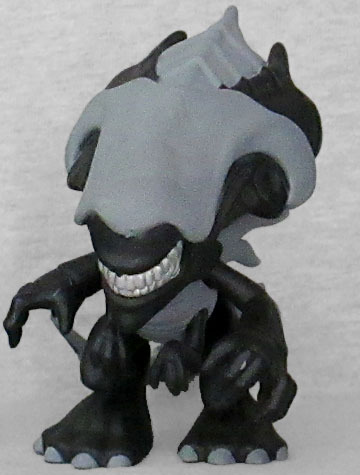 The figure is done in black and grey (no metallic variants to worry about here), with silver teeth. She has four fingers and two thumbs on each hand, and two tiny extra arms sprouting from her chest. The Alien and Predator make for a nice pair, but the addition of the Queen really tips the battle in the Xenos' favor. Funko better come up with some more Preds pretty soon! 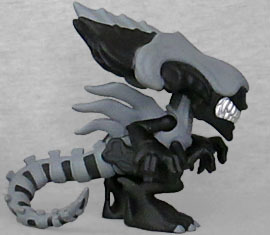 This entry was posted in blog exclusive review, Funko and tagged Alien, Mystery Minis, Predator. Bookmark the permalink. These guys are fantastic - you missed describing the Predator, though. This alien looks a lot better than the POP they did. I agree with you about the Predator -- something is missing that prevents it from being a must-have -- maybe it's the mouth sculpt in tandem with the eye paint? I'd pay money to see "Taken vs. Predator." Imax money.